(Inside Science) -- A robot mimicking a prehistoric fossil suggests the ancestors of reptiles, birds and mammals might have walked more efficiently on land than previously thought. Nowadays, the most widespread tetrapods, or four-limbed animals, are the amniotes -- creatures that lay eggs on land or give birth to live young, rather than laying eggs in water as amphibians typically do. Previous research suggested the freedom that amniotes had to move on land helped support the evolution of a more energy-efficient upright walk that lifted their bodies off the ground. However, the details regarding the development of this more advanced locomotion have proven uncertain due to the scarcity of fossils from that era. 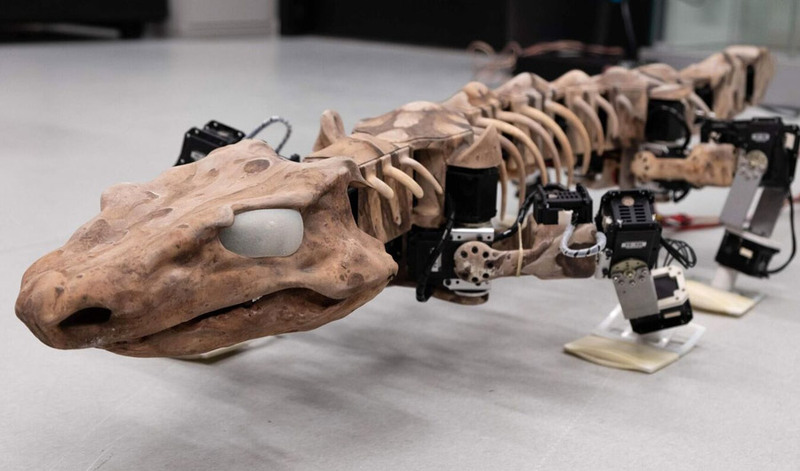 To help solve this mystery, scientists created a robot based off fossils of Orobates pabsti, a plant-eating tetrapod about 33 inches long (85 centimeters). Orobates lived roughly 290 million years ago, before the dinosaurs, and was likely a close relative of the last common ancestor of all amniotes. Prior work unearthed Orobates footprints, yielding clues on its gait. The scientists compared hundreds of possible gaits for this machine, dubbed OroBOT, with those of living caimans, iguanas and skinks (which are amniotes), and salamanders (which are not). They found the gait that best matched the fossils and the footprints had Orobates walk more upright than was typically associated with tetrapods that were not amniotes. These findings suggest this advanced form of locomotion may have evolved earlier than previously thought. Future robots could help shed light on other major evolutionary transitions, such as how the ancestors of birds evolved flight, how the ancestors of humans evolved upright walking and how the ancestors of whales shifted to an aquatic lifestyle, said co-lead study author John Nyakatura, an evolutionary biologist at Humboldt University of Berlin. The scientists detailed their findings online Jan. 16 in the journal Nature. They also created an interactive website where one can explore the possible motions that Orobates might have used.